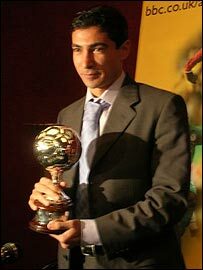 Egypt midfielder Mohamed Barakat received the prestigious BBC African Footballer of the Year award in Cairo on Wednesday. The 29-year-old was instrumental in helping club side Ahly to the African title, a fact which led him to lift the prized award ahead of Cameroon striker Samuel Eto'o, and Nigerian marksman Obafemi Martins. A delighted Barakat, who had his family by his side, admitted: "This award will certainly lift the spirit and morale of the whole Egyptian team. "I know that this award was won because of my form for Ahly, but the star of that team is not one individual but the team itself." Barakat, who becomes the first North African player to lift the trophy, was selected by the readers of the BBC's African football website and listeners of Fast Track, on the BBC World Service. Previous winners include Ghana's Sammy Kuffour, Senegal's El Hadji Diouf and Nigeria's Jay Jay Okocha, who won the award twice. Although Barakat said he is happy to stay with Ahly for the remainder of his career, he is keen to move to a top European club if the opportunity presents itself. "My profile will have been enhanced in receiving this trophy, and it's my ambition to go and play in Europe. "If it happens, then wonderful. If not, then I know I'll still be happy with Ahly." Barakat received the award in the presence of Egypt coach Hassan Shehata and colleagues Ahmed "Mido" Hossam, captain Ahmed Hassan and goalkeeper Essam Al Hadary, who made a surprise appearance at the ceremony. The award will certainly boost his morale, as Egypt prepare to take on DR Congo in their African Nations Cup quarter-final match on Friday.